About 300,000 American children under the age of 14 have epilepsy. It affects children at different ages, and in different ways. For some, it will be a temporary problem, easily controlled with medication, outgrown after a few years. For others, it may be a lifelong challenge affecting many areas of life. long term. Early recognition and treatment are keys to the best possible outcome. It may be associated with serious, difficult-to-treat syndromes, including infantile spasms, Lennox-Gastaut syndrome, genetically related conditions, and developmental disorders. Below are answers to some common questions about epilepsy in children. Feel free to contact us to learn more. What Causes Seizures in Kids? Most seizures in childhood are not associated with a definite cause, however. Less common causes of childhood epilepsy include brain tumors or cysts and degenerative disorders (progressive and deteriorating conditions, often associated with loss of brain cells). There is an important difference between something that causes seizures, such as a high fever in a young child, and something that causes epilepsy, such as a severe head injury. What kinds of Treatment are available to children with epilepsy? There are several options for treating epilepsy, and it may be a trial process to figure out what method, or combination thereof, will work for your child. These include medication, surgery, the ketogenic diet, and nerve stimulation. You can read about these more on our Treatment Options page. For information on how long a child may need to take seizure medicine, click here. I hear a lot about Immunizations in the news, should I be concerned? Extensive and careful studies have not found any evidence that immunizations cause epilepsy. However, a seizure may occur within 1 or 2 days of an immunization, especially if it is followed by a fever. In such cases, the child probably had an innocent febrile seizure. When the child receives immunizations, the parents should give acetaminophen (Tylenol) or ibuprofen (Advil, Motrin) before a fever develops. Children who have a single seizure following an immunization can usually receive further immunizations. When a child has epilepsy it impacts the entire family. It will mean some changes, but they don’t have to be for the worse, especially when you are in control. On a day-to-day basis, it will be useful to establish routines. Have your child take his or her medication at the same time every day. Set up a regular schedule for homework, study and playtime to help them keep up with school while still enjoying life. Give your child chores that they can do! This will help them feel like they’re contributing while not potentially alienating other siblings. And of course, include the whole family. How can I help my child at school? It’s one thing to keep your child safe at home, but it’s a different story when he or she is away at school all day. A great first step is to contact an EFEPA Resource Coordinator to learn what your child’s rights are in school. They can help you figure out the process of securing school accommodations or an Individualized Education Plan. Then, we can work with you to schedule a Project School Alert training! We can educate your child’s teacher, school nurse, bus drive and fellow students on seizure first aid, epilepsy awareness and how to talk about seizures. These steps can be instrumental in creating a safe, welcoming environment for your child. Learn more about these resources on our School Information page. If your child is being bullied we encourage you to reach out to us quickly. Likewise, you can refer to this guide on bullying from StopBullying.gov. Can my child still play sports and do other activities? Common sense should be the guiding force in making these decisions. The goals should be both safety and a lifestyle that is as normal as possible for your child. While no activity is completely safe, restricting kids too much could lead low self-esteem and emphasize the disability. 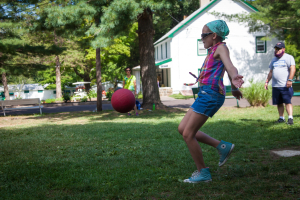 Certain activities and sports can be dangerous for some children, especially if seizures are not well-controlled. Talk about each activity with your child’s health care team first. Most often, they can help figure out a way to let the child be active, participate and have fun. Team or group activities are a great way to encourage a sense of “belonging” and Independence. Exercise rarely provokes seizures. It is possible though, especially if your child gets too tired or dehydrated while exercising. If a pattern between seizures and exercise is seen, limit that type of exercise. Or try the activity for shorter periods of time, rest frequently and stay well-hydrated. Encourage the activity during the coolest parts of the day in hot weather. Swimming is a pleasure all children should be encouraged to enjoy. Although water poses special dangers for children with seizures, there is usually a way to make this a safer activity for most children. The main question is – how much supervision is needed? Children with severe or frequent seizures can enjoy the water if a parent or caregiver holds them in a shallow pool or body of water. Wear a life jacket too! 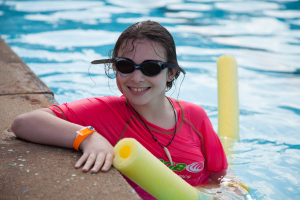 Children with well-controlled seizures can be encouraged to swim with reasonable safety tips. Make sure that at least one person who knows the child has epilepsy and who knows basic lifesaving is nearby. Make sure the child knows how to swim. Depending on the child’s health, ability to swim, and amount of available supervision, children with seizures should avoid swimming in deep water. Tips for children with occasional seizures that affect motor control or awareness. Supervise the child closely. Seizures are unpredictable and many are difficult to detect. Encourage swimming only when a lifeguard is on duty who is responsible and aware of the child’s disorder, as well as another child in the pool who is the buddy. The lifeguards should know that they must keep their eyes on the pool while the child is swimming. The buddy system (used by many camps for children and by adult scuba divers) is another precaution to keep children safe. The buddy should be responsible, understand the need for keeping an eye on the child, and should never go far away in the pool. Can my child go bike riding? Everyone who rides a bicycle should wear a helmet. Injuries on bikes most often involve the head. If the seizures are under control or do not impair motor control or consciousness, bicycle riding should not be restricted. Ride bikes in a park or other safe place away from motor vehicles. Stationary bicycles for exercise pose no serious danger for children with epilepsy. Ideally, the floor should be carpeted or padded. Low-seated bicycles are the safest.